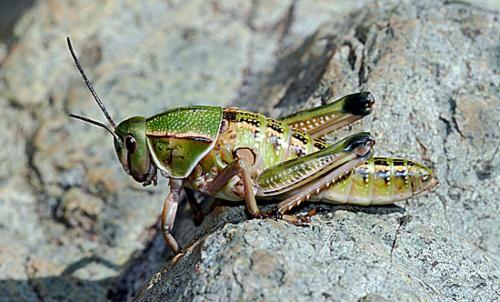 GRASSHOPPERS I - NWI & Assoc. 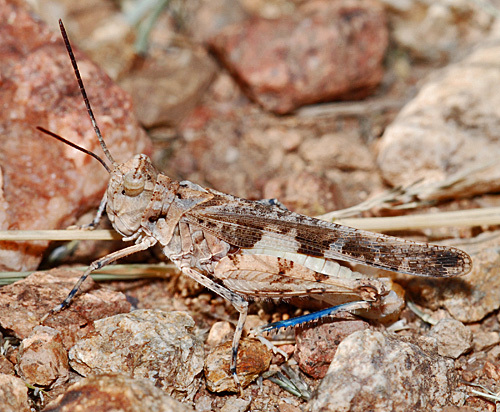 Located at five thousand feet where the grasslands of the Chihuahuan Desert meet the lowest oaks of the Huachuca Mountains, our yard is well situated to host a wide variety of not only birds and butterflies but also grasshoppers, katydids and crickets. 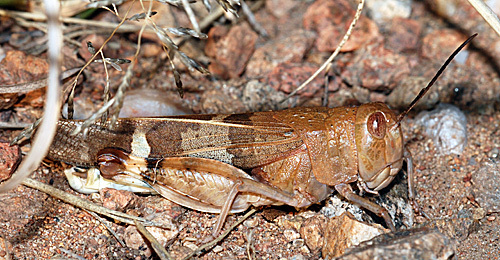 The Huachucas-one of the border's isolated Sky Island mountain ranges-have a grasshopper fauna with a number of affinities to Mexico's northwestern Sierra Madre. 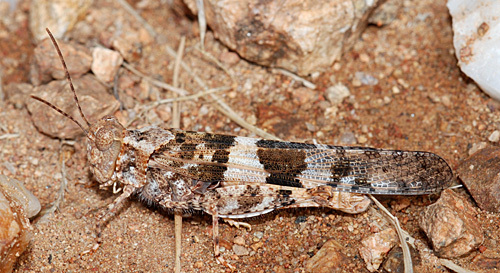 Here, only 3 1/4 miles north of the Mexican border, we can find species such as Snow's Toothpick Grasshopper that barely enter the United States. So far, 49 species of grasshoppers have been recorded in the yard, all depicted by the following images. Unless noted, the photos were taken in our yard, defined here as the acre upon which our house is situated, as well as our adjoining acre to the north. The photos on this and next two pages are divided into families: Romaleidae (Lubbers), Acrididae (Short-horned Grasshoppers- further divided into four sub-families), and Tetrigidae (Pygmy Grasshoppers). 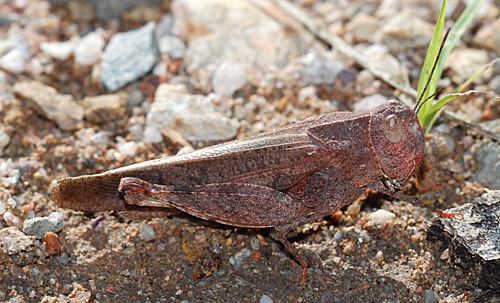 Like many grasshoppers, the Speckle-winged Grasshopper (Arphia conspersa) occurs in a variety of colors so as to match the ground on which it sits. (17 August 2008). 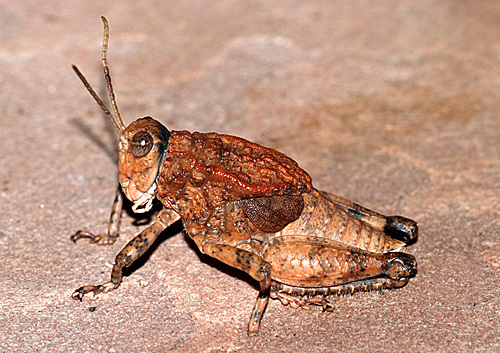 Most Northwestern Red-winged Grasshoppers (Arphia pseudonietana) are solid black or very dark brown. Occasional individuals are pied with paler colors. Like the Horse Lubber, it posesses bright red hindwings. Its loud, crackling flight is a familiar sound during late summer. (26 September 2008). 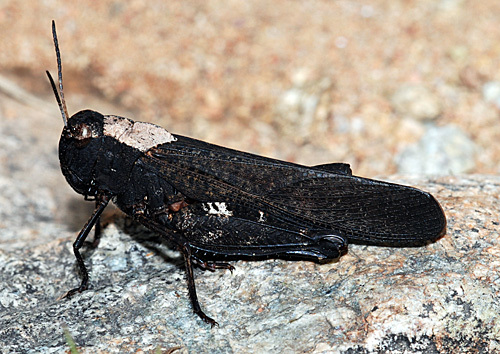 Ridged Grasshopper (Conozoa carinata). Field marks visible here include the tooth at the lower rear corner of the pronotum, two wing bars that don't cross the forewing (the front bar-more of a spot-shows here), and the ridge atop the entire length of the pronotum. The hind tibiae are yellow. (20 April 2010). 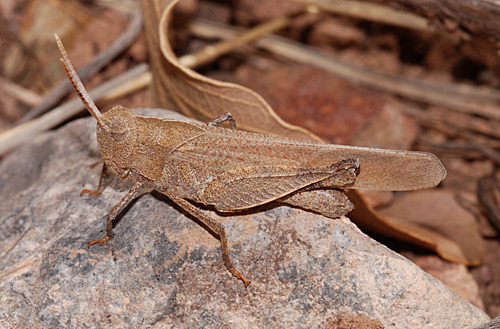 By September, the Arroyo Grasshopper (Heliastus benjamini) becomes one of the most common grasshoppers in the rocky-graveled portions of the yard. In flight, it flashes bright rosy hindwings. (23 August 2006). 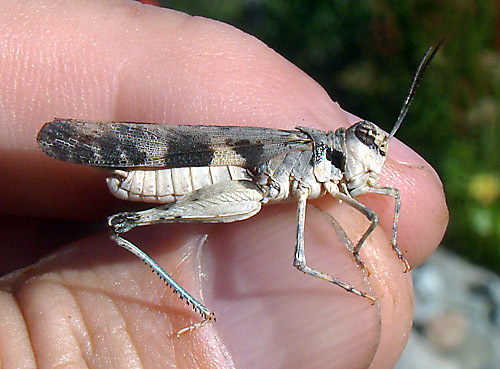 The Aztec Spur-throat Grasshopper (Lactista azteca) can usually be identified by the band on its forewing that is aligned with another on its hind femur. Gray, brown, maroon, cream-colored and speckled individuals may be encountered on different soils. (30 October 2007). 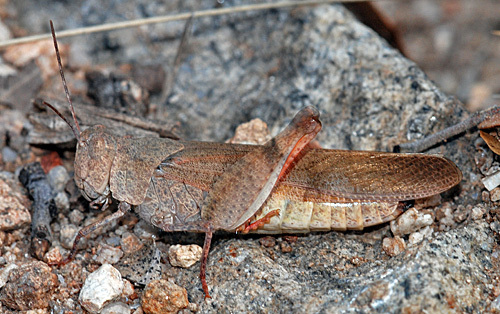 Platt range grasshopper (Mestobregma plattei), a widespread Great Plains species that may have a red, orange, or yellow patch in the hind wing (16 September 2009). 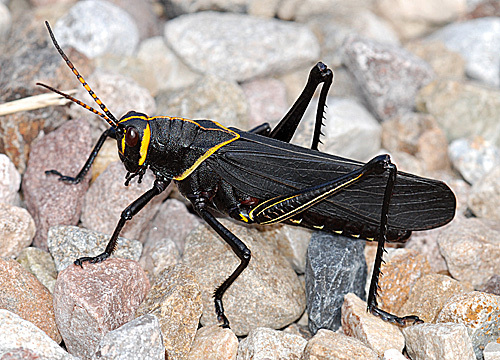 Locally, the Kiowa Rangeland Grasshopper (Trachyrhachys kiowa) is one of the most widespread bandwings (6 September 2008). No common name (Trimerotropis modestum). Other populations in SE Arizona have more strongly marked forewings, This pale individual was photographed at Fort Huachuca, Sierra Vista, AZ. (23 August 2008). 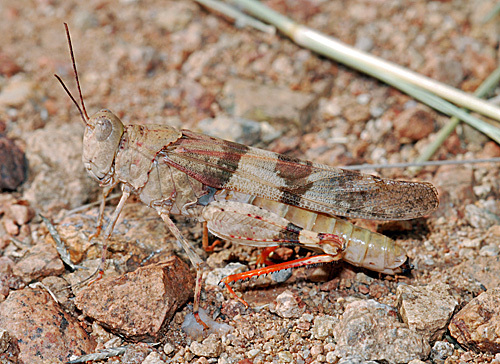 Strenuous Grasshopper (Trimerotropis californica) occurs on the open ground of our undeveloped lot (7 September 2008). 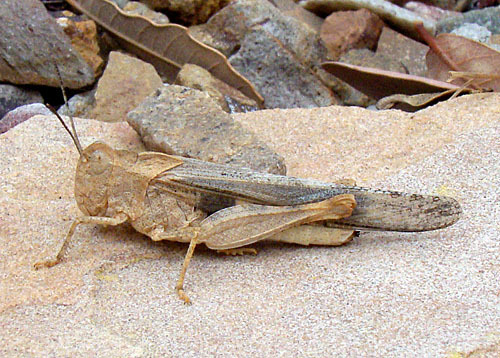 Pallid-winged Grasshopper (Trimerotropis pallidipennis) is the most common and widespread of the large band-winged grasshoppers in the area (26 September 2008). 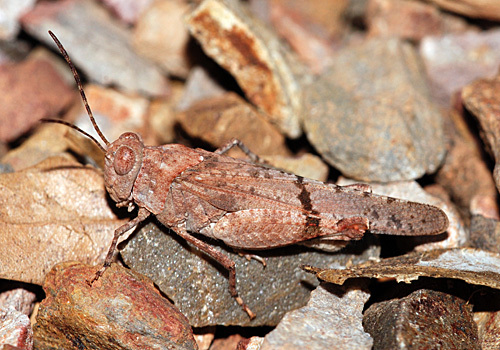 Although visible on this rock, the Oak-leaf Grasshopper (Tomonotus ferruginosus) is nearly impossible to spot in the dry leaf litter it favors. The nymphs are often common during winter. 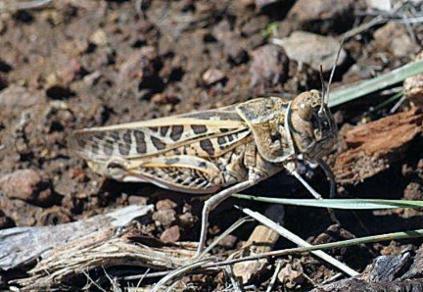 This individual was photographed on Fort Huachuca. (4 April 2008). 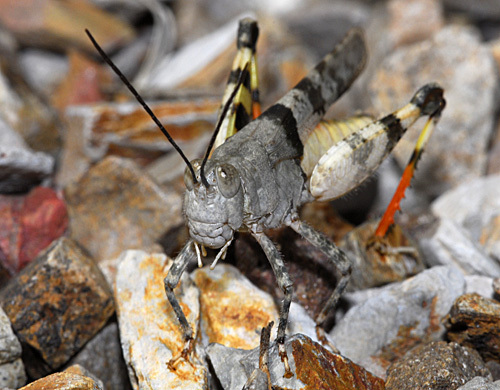 Karen shot this Red-shanked Grasshopper (Xanthippus corallipes) on the front lot. It was the 49th 'hopper for the yard (23 July 2018).